Apple mobile devices like the iPhone and iPad can be backed up to your computer using iTunes, or backed up to the cloud. Many people don’t regularly connect their mobile devices to their computer and take the time to synchronize with iTunes. Months may go by without any backup or synchronization. Perhaps the devices are never backed up or synchronized. 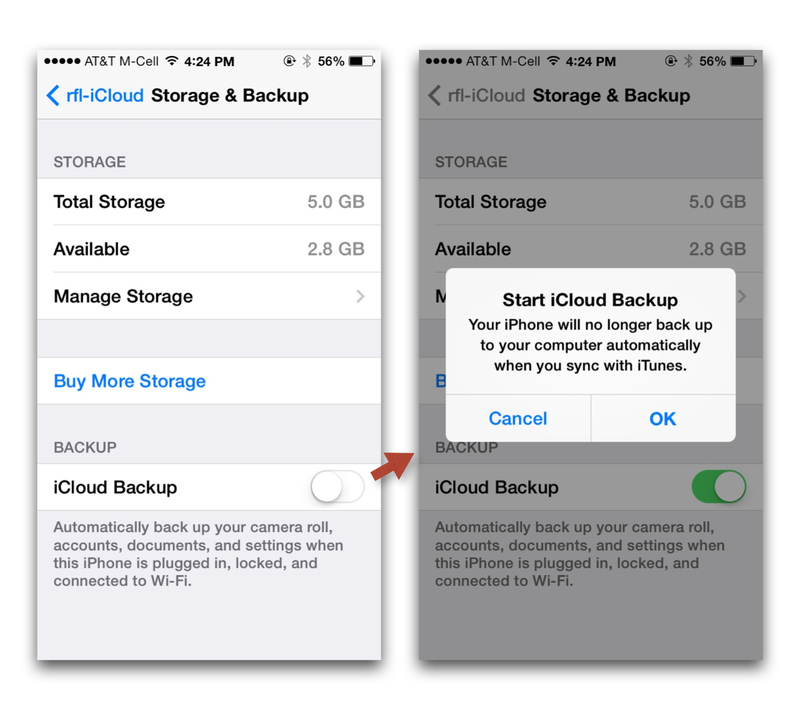 So, it’s best to use the Apple iCloud service to actively maintain a backup of your device. 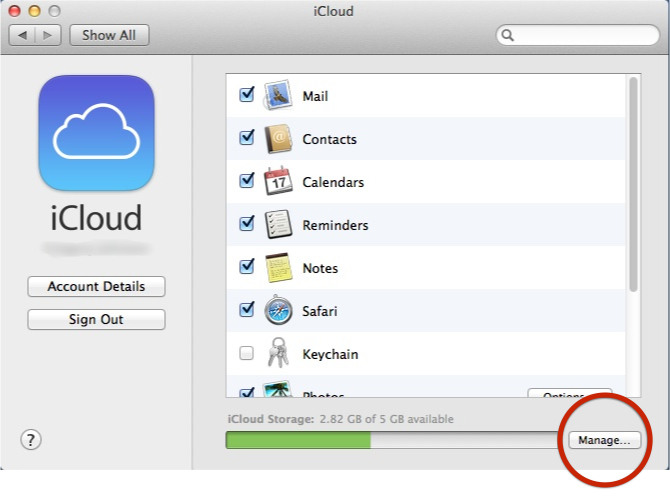 These screen shots show how to manage your iCloud storage on an Apple computer. The steps are similar on a Windows computer (by clicking on the iCloud icon in Control Panel). Select System Preferences on your Apple computer. It is found under the Apple menu. From the System Preferences window, choose iCloud as shown below. In the iCloud settings window, choose Manage. 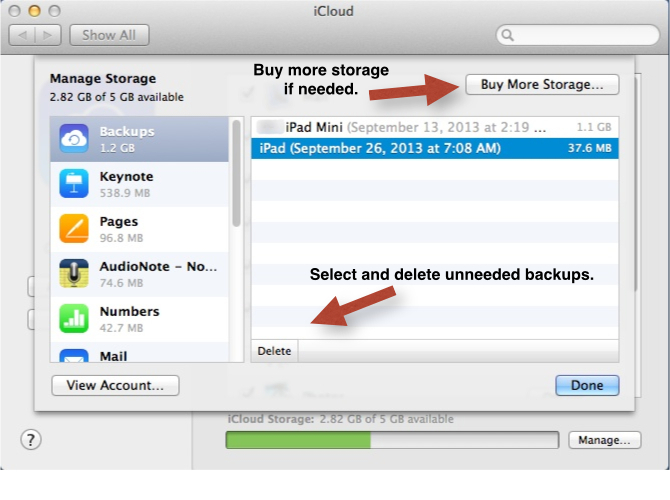 From the iCloud management window, it is possible to buy more storage or delete backups that aren’t needed anymore. 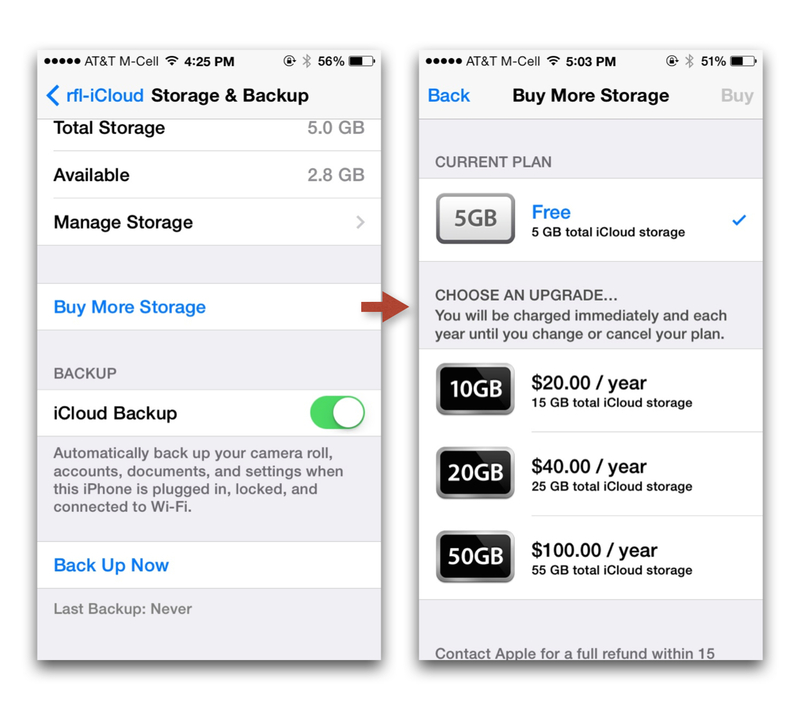 For example, when you purchase a new phone the old backup may remain in your iCloud backup system. 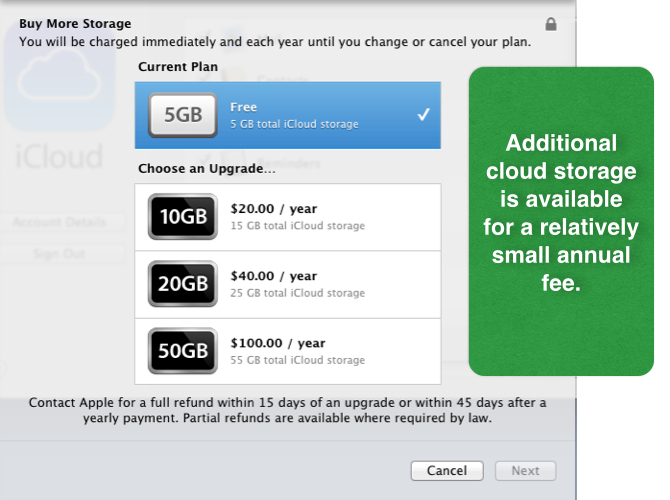 If you’re buying more storage, the pricing is shown below. If you have a 16GB, 32GB, or 64GB device, you might wonder what storage capacity is needed. The backup of your settings and application data will likely be much smaller in size than the overall capacity of your device. 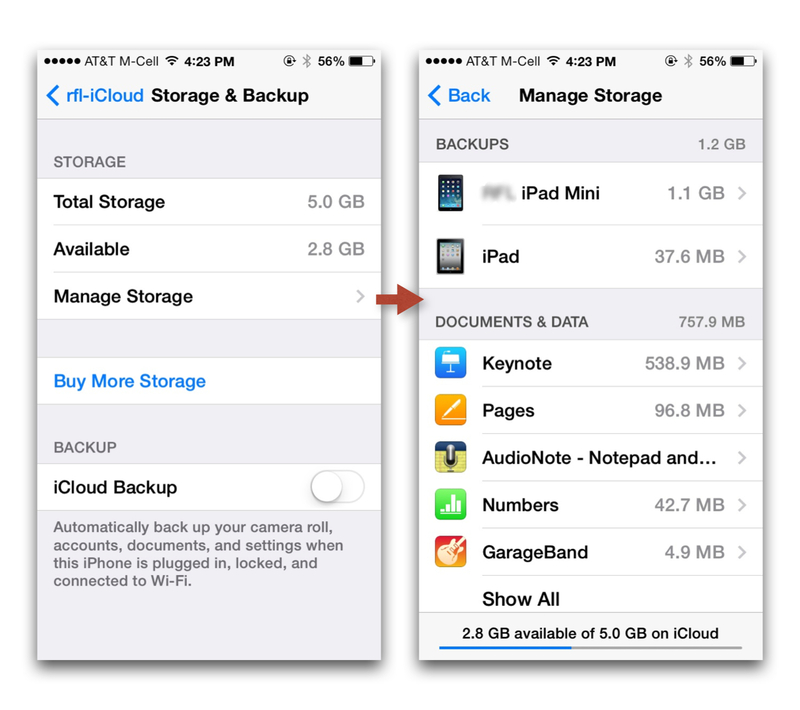 To manage iCloud storage on your iPhone, the steps are similar to those outlined above. Go to settings and select iCloud. 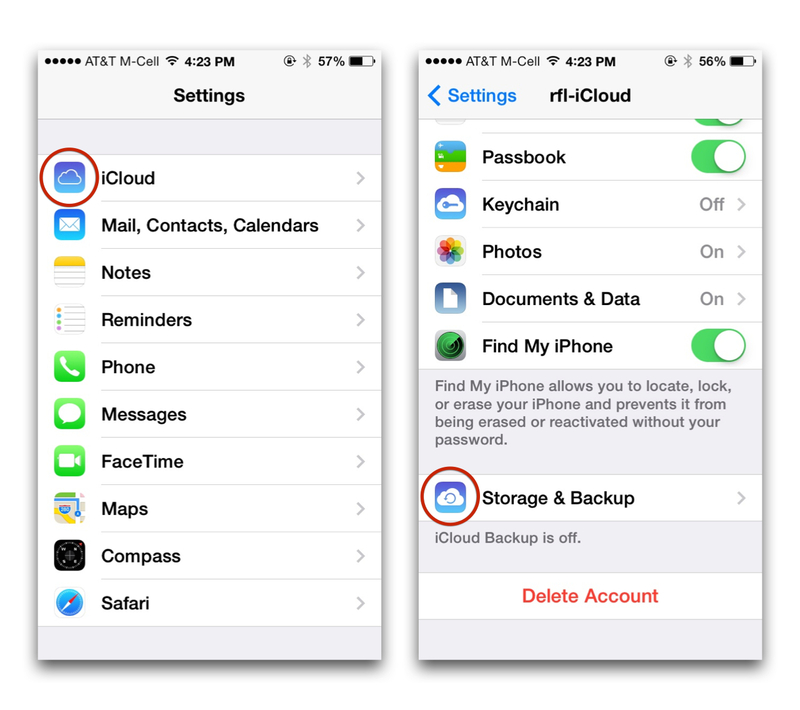 From the iCloud settings window, choose Storage & Backup. Within the Storage & Backup settings window, choose Manage storage to see how much storage in the cloud is being used by your various devices that are sharing the iCloud storage. The Manage Storage screen will give you a good idea of how much storage your programs are using. The example below is typical. The iPad Mini backup shown below is for an 8GB iPad Mini that is filled to capacity with programs. However, since the programs and operating system are easily installed again from the iTunes store, the only data needed to be backed up would be a the information used by the installed programs. When you select the option to Buy More Storage, a list of options is show.